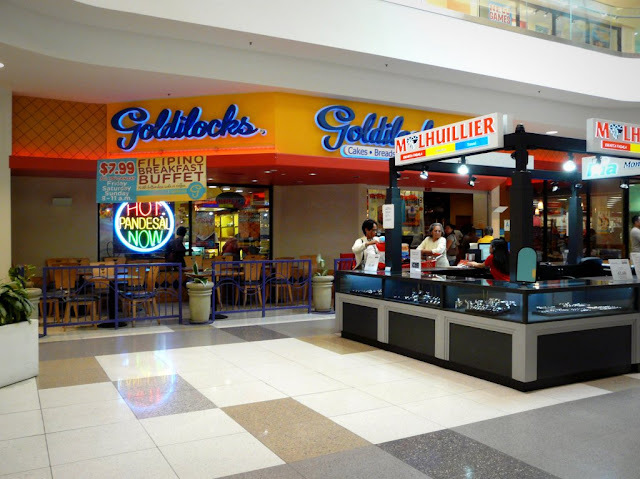 Goldilocks is a Filipino restaurant with roots in the Philippines ever since I can remember. They started out as a bakeshop and it eventually expanded by offering hot food items, equivalent to what you will find at cafes and Chinese tea houses. In other words, Filipino comfort food. 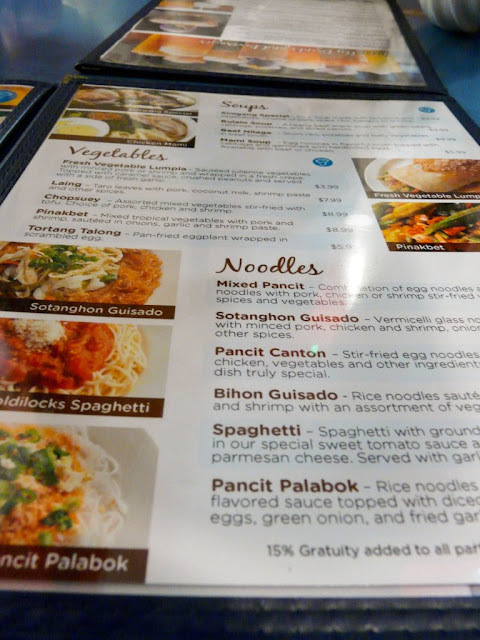 They then expanded their operations overseas, so Filipinos abroad, particularly in the US, can satisfy their cravings for Filipino food. 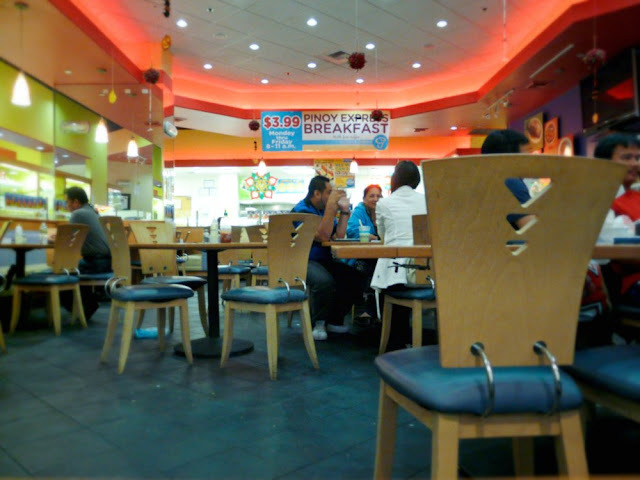 This particular restaurant is in Eagle Rock, a suburb of Los Angeles, at the corner of the 2 and the 134 freeways, or to be more specific, inside the Eagle Rock Plaza Mall on Colorado Boulevard --- lower level. Shot of the dining area. 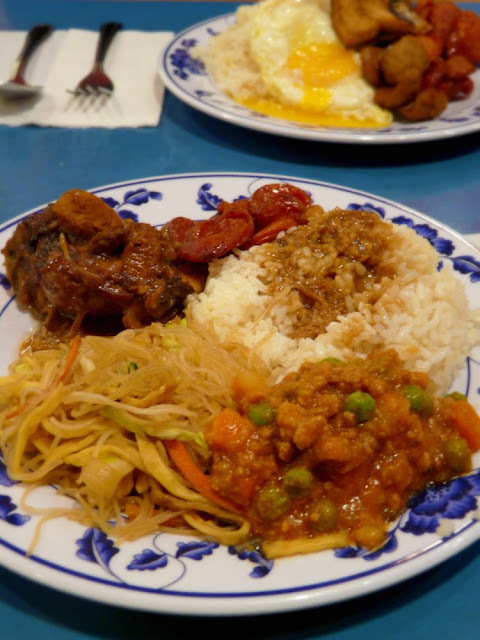 Mostly Filipino comfort food that you can eat almost any time of the day. 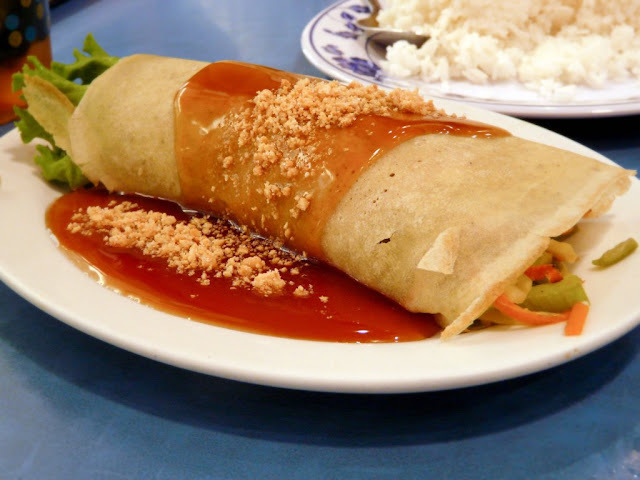 Vegetable Egg Roll (Fresh Lumpia) - It has vegetables, mainly carrots, potatoes, celery, snow peas, etc. sauteed in garlic and onion, wrapped in traditional lumpia wrapper made of rice flour. Drenched with sweet sauce, topped with chopped peanuts, and fresh chopped garlic on the side. I, Gingham Girl always eat this with fresh garlic. That's the only way to do it for me, or don't do it at all. I don't care if my date was Matthew McConaughey looking all hot in that Dolce and Gabbana tv ad, I am still having my lumpia with garlic. Sometimes, I come to Goldilock's just for the lumpia. 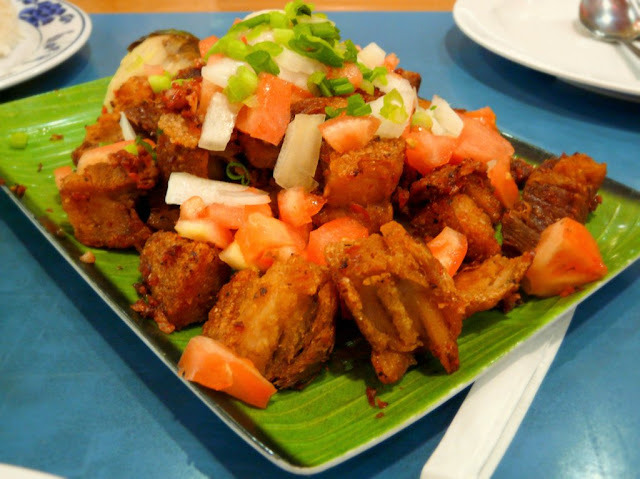 Binagoongan - Crispy deep fried pork bellies tossed with some bagoong (shrimp paste) garnished with tomatoes, onions and green onions. This is not the traditional binagoongan. I really did not care much for this at all. The whole dish is too dry while the binagoongan I am used to is a little on the saucy side, and I did not get a strong taste of bagoong which is what I am looking for. 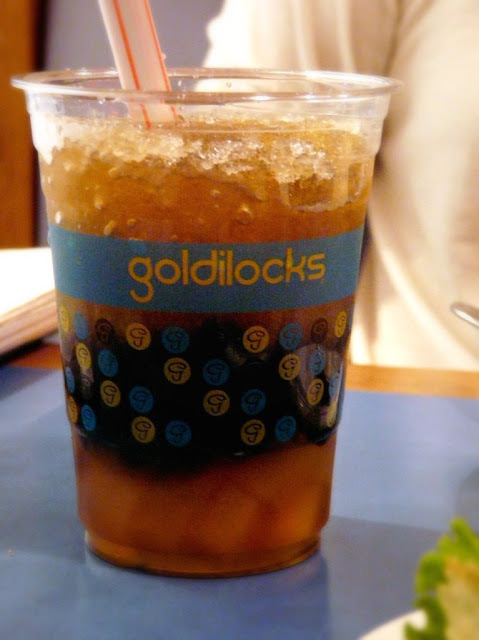 Sago't Gulaman - Classic Filipino cold drink. It's sweet, with tapioca balls and gelatin made of agar agar. It's just like being back home. 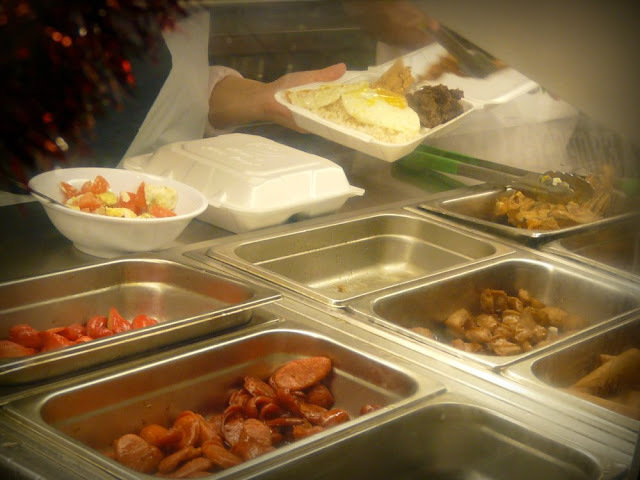 Filipino Breakfast Buffet - There are a lot of selections in this "turo-turo" (point-point) style buffet. You point at what you want, and they put a good portion on your plate. 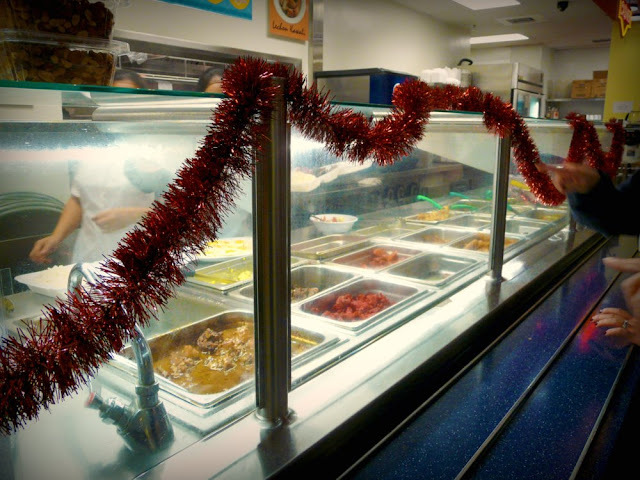 You can have up to four items at a time, but you can come back to the line for a refill or to try other items. For $7.99, that's really good. However, the quality of the food is so-so. It's not like my mom's cooking, so to speak. ...adobo, tuyo, pancit, giniling, champorado, to name a few. 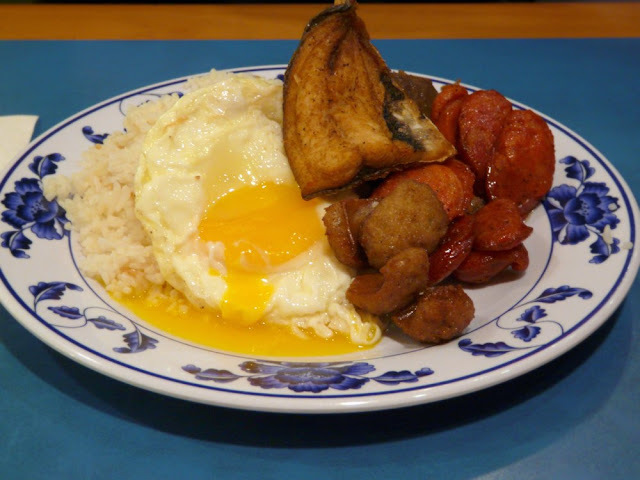 I had garlic fried rice, egg, daing na bangus (marinated fried milkfish), longganisa (Filipino sausge), Tilapia sausage (tilapia fish turned into sausage). I enjoyed the daing and the tilapia sausage. The longganisa is a different flavor from what I am used to. The tapa (marinated sliced beef) was tough, and the flavor is not like the one back home. I should have passed that up. This is Veggie Girl's plate which consists of garlic rice, pancit, chicken adobo and giniling. Her favorite was the giniling which is cooked differently than what I'm used to. They use canned tomato sauce while I use fresh tomatoes in mine. I tried it as well but wasn't a huge fan.